ELMHURST – Mayor Steve Morley – with the help of Elmhurst City Council members and Park District officials – temporarily changed the color of Salt Creek’s water to an emerald green this morning in honor of today’s St. Patrick’s Day Parade, pouring 15 pounds of an eco-friendly vegetable-based dye into the creek. The process took place at the Elmhurst Salt Creek County Forest Preserve, just north of St. Charles Road and west of Route 83, where flour sifters were used to pour the powdery substance into the water. 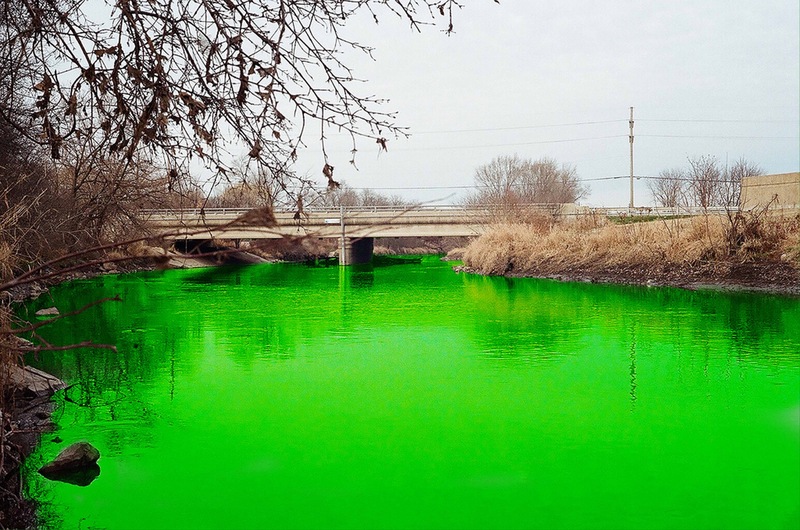 A small motorboat piloted by Mayor Morley helped spread the dye, and within an hour, nearly the entire Elmhurst segment of Salt Creek had turned green. The creek color will return to its natural murky-brown by Sunday morning. I went down early to watch them dye the river. It was a beautiful sight to see. The York swim team was wading in the water just north of the Prairie Path at 11 am, pulling a pontoon painted with the Duke logo. After the parade I saw the swim team wrapped in blankets, sipping hot chocolate in the Silverado parking lot. Their skin was tinted green and a dermatologist was tending to them. Apparently the dye is fine, but the Salt Creek water, not so much. The sad part was, as we all know, those poor green kids got no candy. By Silverado, all the floats are fresh out. Buy more candy if you want my vote, random-dude-shaking-hands-in-parade!!! Although eco-friendly, unfortunately the dye reacted negatively with long times inhabitants of Salt Creek, and for days afterward, old refrigerators, dead wildlife and a few rotting carcasses of yapping dogs were popping to the surface. Also spotted, an ancient Amlings shopping cart, a plethora of auto tires, a large sign reading Welcome to Elmhurst (Teardown Town) spray painted on it, and dozens of running shoes from The Long Green Line,apparently lost or stolen!